Crazy Vegas Casino provides the best in online gaming. It’s members are offered the best and the most popular games to choose from, powered by the renowned Microgaming software. Regular promotions, rewarding online casino tournaments, and a great loyalty program keep members busy 24/7. Crazy Vegas Casino is definitely that virtual online place where adventure and rewards intertwine. The destination offers a 100% bonus of up to USD/EUR 500 on as many as 5 Deposits which allows punters to bet their bonus 50 times and to place a minimum of 100 wagers. Crazy Vegas Casino also offers between 15 and 30 Free Spins in promotions. Once you have completed your 30 spins, you may continue to play with your winnings. VIP Rewards Points are also given out to loyal casino players. These are called C-Bucks which can be spent in the casino or exchanged for more Casino Credits. The more you play the more C-Bucks you earn. Every 10 Credits puntered will get players a minimum of 1 C-Buck. 500 C-Bucks redeemed gets you 2 Casino Credits and 1000 C-Bucks gets you 5 Casino Credits. 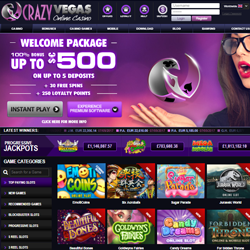 Games you can enjoy at Crazy Vegas Casino are Blockbuster slots, progressive slots, 5 reel slots, 3 reel slots, roulette, Table games, video poker, Variety games and of course 21 different kinds of top online blackjack games. Crazy Vegas Casino also gives you the chance to play Free Online Blackjack. 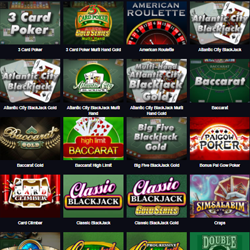 Both single hand and multi-hand versions of free blackjack are featured at Crazy Vegas Casino. With high odds of winning, Blackjack is one of the most preferred game played at Crazy Vegas Casino. 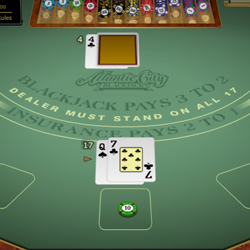 Players can enjoy the basic version of Blackjack called Classic Blackjack which involves a game that pits players against a dealer as both vie for the magic number 21. To this simple version comes interesting twists in variations like Atlantic City Blackjack, Bonus Blackjack, and Blackjack Gold. With such a wide selection of Blackjack games at Crazy Vegas Casino you certainly have a luxurious line-up to choose from. Thanks to the free e-book called “Winning at Blackjack” which can now be downloaded from Crazy Vegas Casino, pros or rookies can gain knowledge and experience through the amazing history of Blackjack and as the subtle nuances of gameplay unfold. Crazy Vegas Casino’s games are powered by the remarkable Microgaming software, which allows for a decent variety. Hopefully, the casino will eventually add more developers to the list. Big Five Blackjack, Classic Blackjack Gold, Hi Lo 13 Blackjack, High Streak Blackjack, Multi-Hand Bonus Blackjack, Multi-Hand Blackjack, Perfect Pairs European, High Streak Blackjack, Classic Blackjack, European Advances Blackjack, High Limit European, Atlantic City Blackjack, Double Exposure, Spanish Blackjack Gold Series, Vegas Downtown, Vegas Strip, Super Fun 21, Classic, European Blackjack Gold, Atlantic City Gold, European Gold, Multi-Hand Atlantic City Gold. There are over 600 games at Crazy Vegas Casino, plenty of which are novelty titles. However, the majority of the titles are casino classics such as slots, video poker, baccarat, or roulette. Welcome Bonus: 100% Deposit Bonus of up to EUR/USD 500 on up to 5 deposits, and 30 Free Spins. Crazy Vegas Casino has a packed tournament schedule, so on top of your usual gaming you can compete with other players for some cash or bonus prizes. Crazy Vegas Casino assures players that they will be offered only the best quality when it comes to Online Casinos and their games. The feeling of excitement and adventure of playing to be a Blackjack winner is a feeling that the online casino wishes every player that goes there. Crazy Vegas is also on the mobile bandwagon which gives you the chance to Go Mobile and enjoy the best gaming entertainment on your phone or tablet. A welcome offer of a 100% Deposit Bonus up to $500 on up to 5 Deposits and 40 Free Spins on Avalon when you make your 1st Deposit, await you. US Dollar, Australian Dollars, New Zealand Dollar, British Pound, Canadian Dollar, Euro, Russian Ruble, Swedish Krona, Swiss Franc.